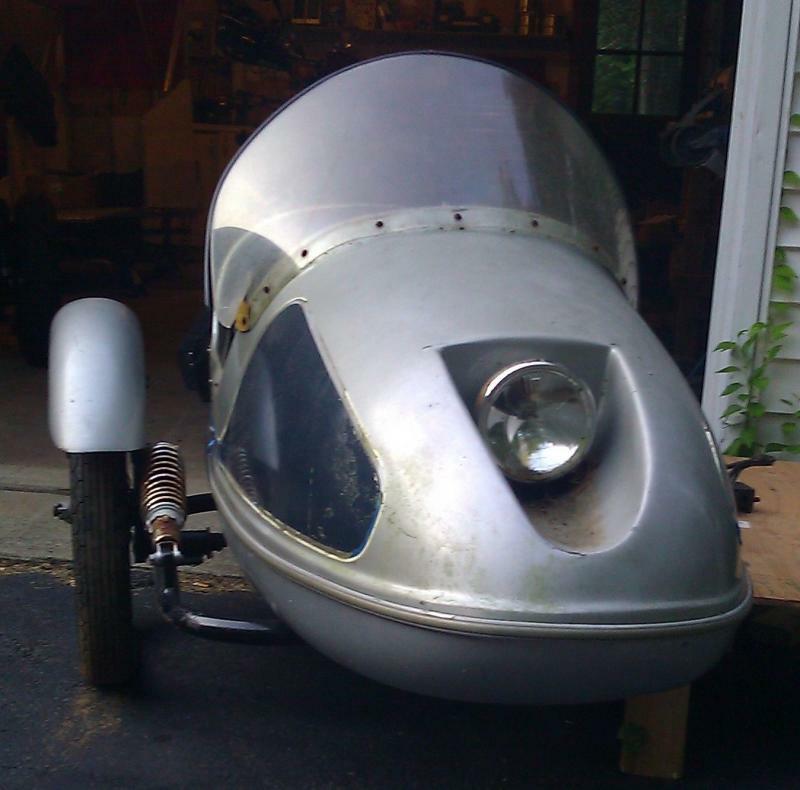 Here are some pictures of vintage sidecars from some American sidecar companies you may never heard of. 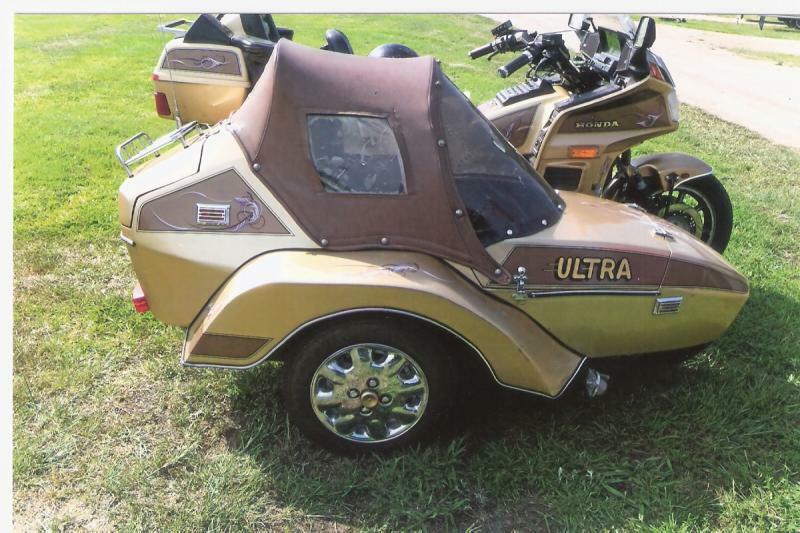 This is a Sweet Chariot Sidecar. It was built in Portland Oregon. It had a solid axle and the body was mounted on rubber dampers. 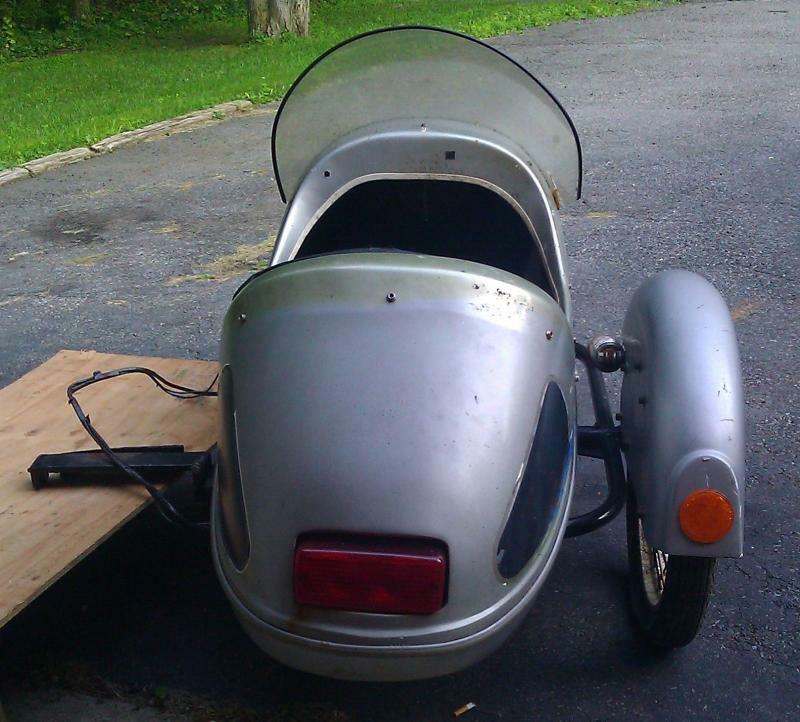 The sidecar frame could be turned over to make them a left hand mount if needed. It had a small tire to absorb road shock. Made in the 1980's I think. Frank worked out of his home. Around 1981 he bought a huge "Iron Man" machine for his rear detached garage that punched holes in & bent thick 1" or so wide steel. This allowed him to make his own fittings without the expense of jobbing them out to another factory. He also cast cement mixed with lead shot about an inch thick for his sidecar floors in his garage. 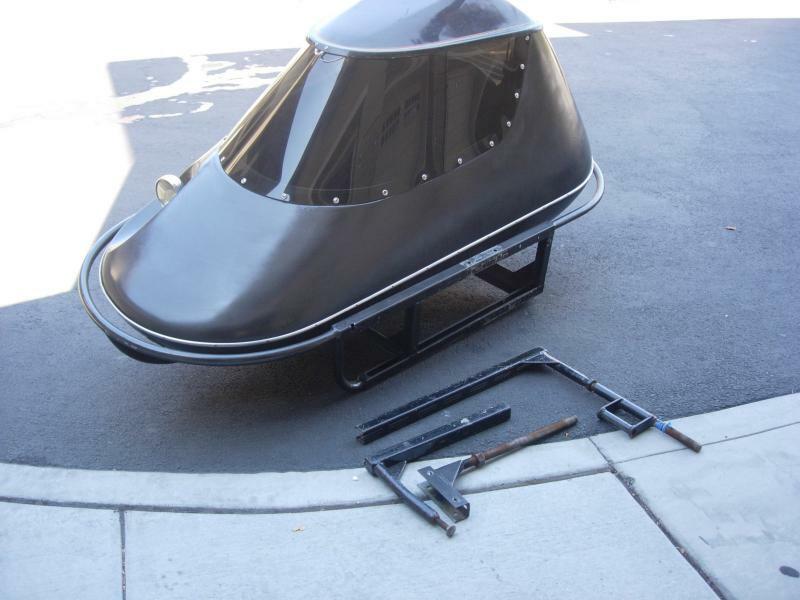 These were installed as an option so empty sidecars would not lift. "Crude, but effective." 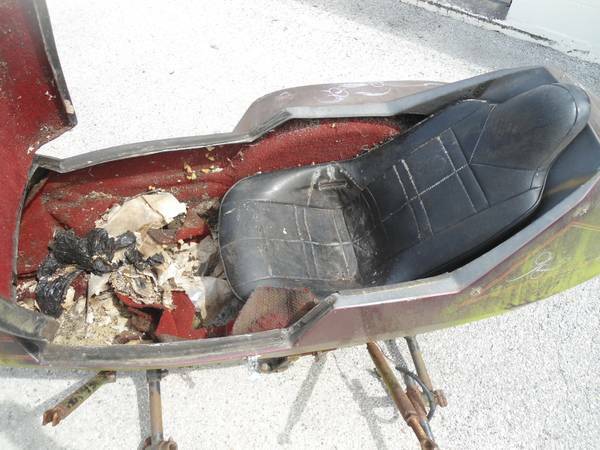 The Cyclecars were VERY light, and this was a big Cyclecar drawback when empty. 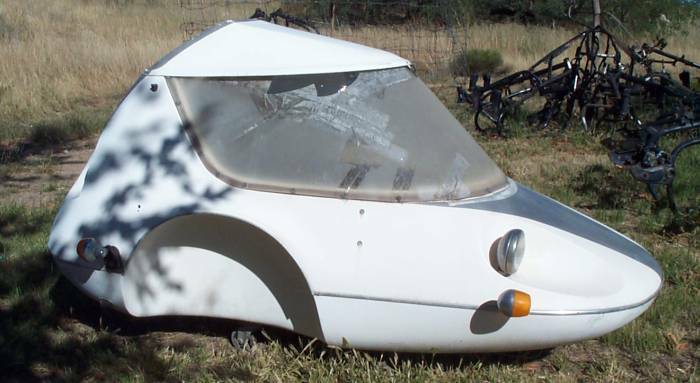 A new Cyclecar may be built some day by DMC Sidecars to use as a scooter sidecar as they are a very light weight sidecar. This is Asa W and wife. 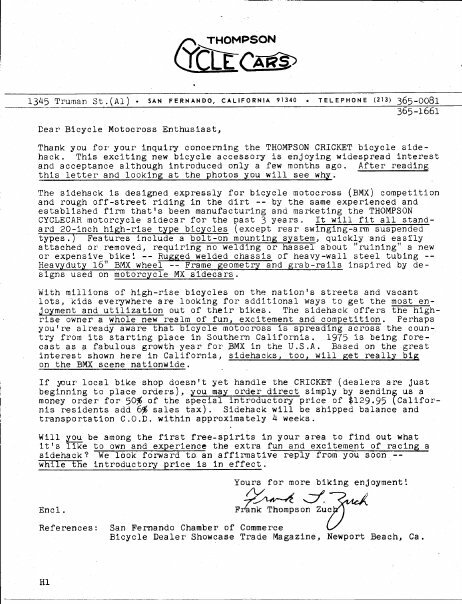 He purchased the second Thompson Cyclecar made on November 20-1971, serial number 0002. It was mounted on his Honda 750. 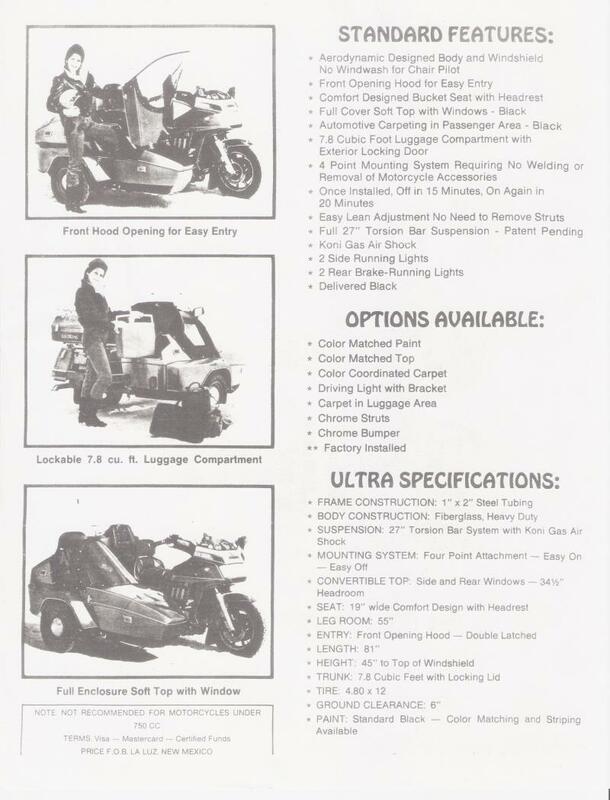 That is him pictured on the sales brochure. Thank you for the great pictures Asa. 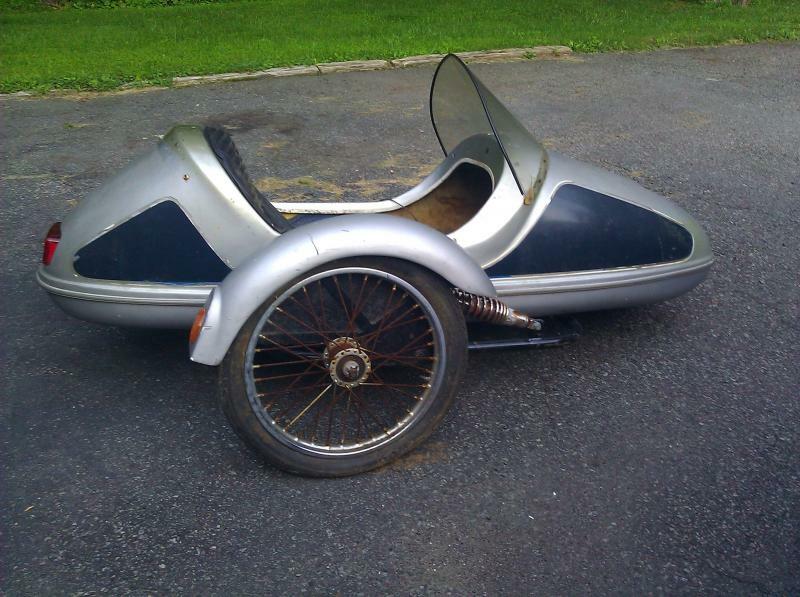 This Thompson Cyclecar is made from aluminum. It has a water soluble coating. 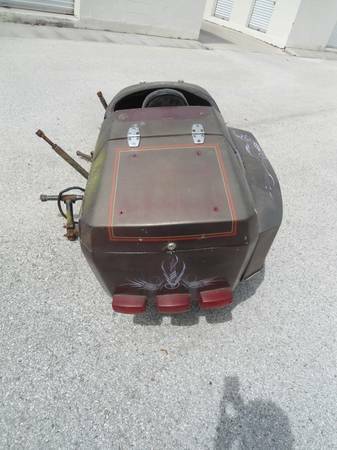 It was purchased at a motorcycle swap meet in Monterey, California for $100.00 in October 2015. I am guessing that it was the prototype (plug) that Frank built to make a fiberglass mold from. Thank you to Larry S. for the picture and information! 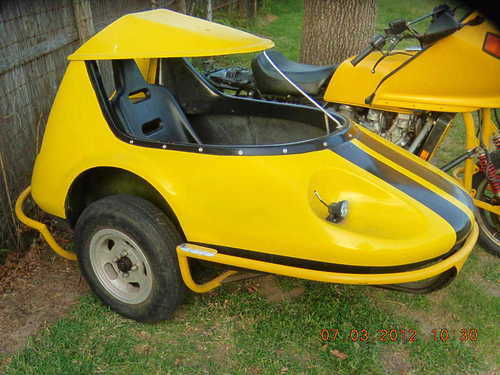 This is a 1980 Thompson Cyclecar on a 1976 Honda 360T. 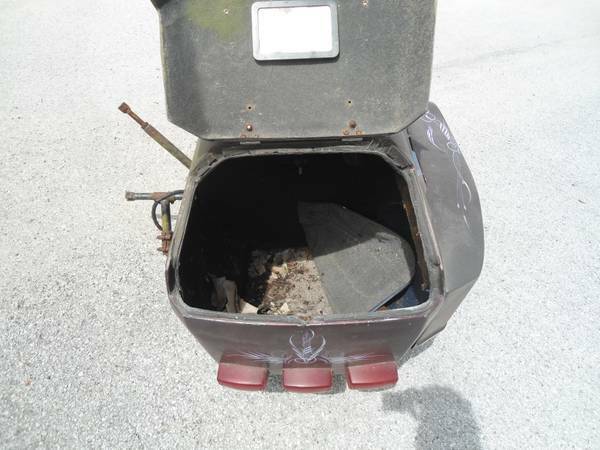 The owner purchased it new in 1980 then after setting it up went to take it for a test drive and crashed it into his car in the driveway. You can see the smashed maker light on the front side. 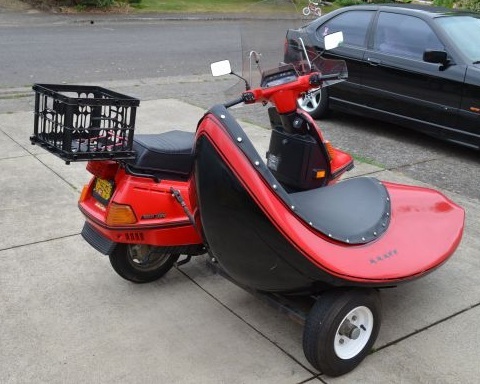 He then parked it in his shed where it sat till Rick P. purchased it from the late owners estate in 2017. The bike just has 88 miles on it! 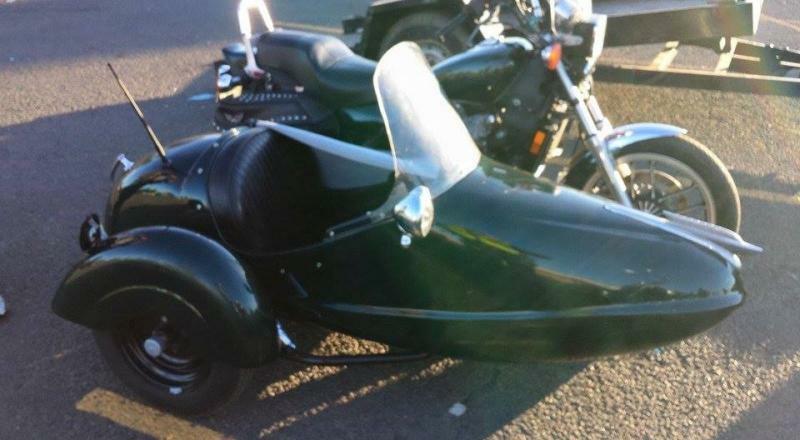 The sidecar maybe 20 feet! 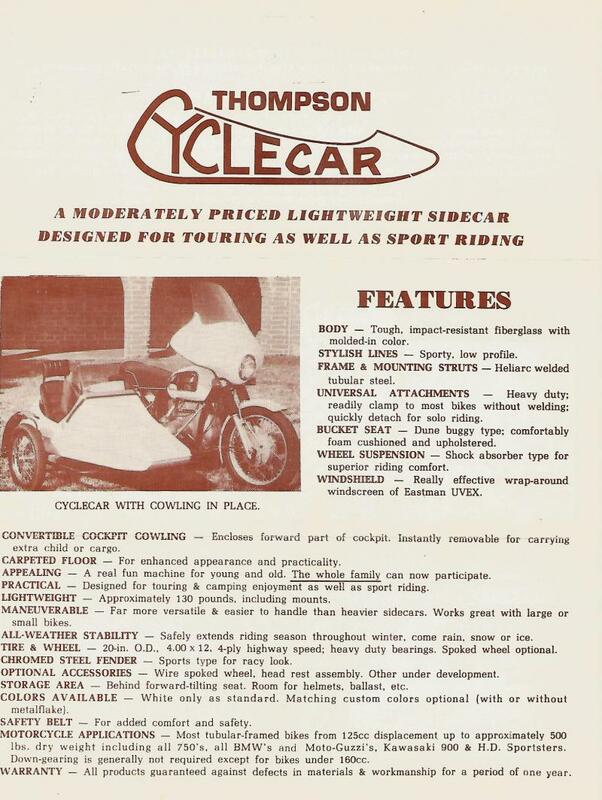 See more about Thompsom Cyclecar company below. 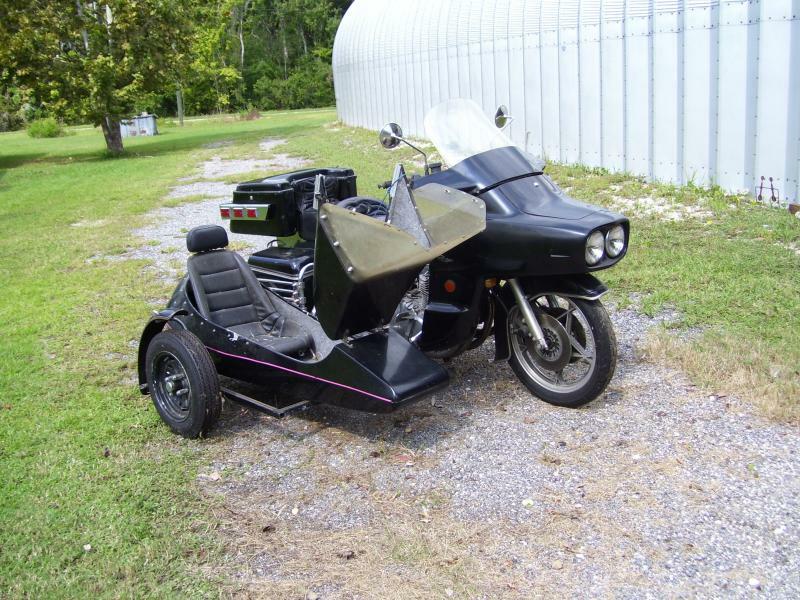 This is a Cyclemotive Sidecar. First built in 1976 by Dave Hokans at 199 Spring Street Glaston Connecticut, later they changed their name to Center-Flex Systems and moved to 88 Isabelle Dr, Meriden, Connecticut. They had two models: The Sport $695 (pictured) and the Sport Tandem $795 new. 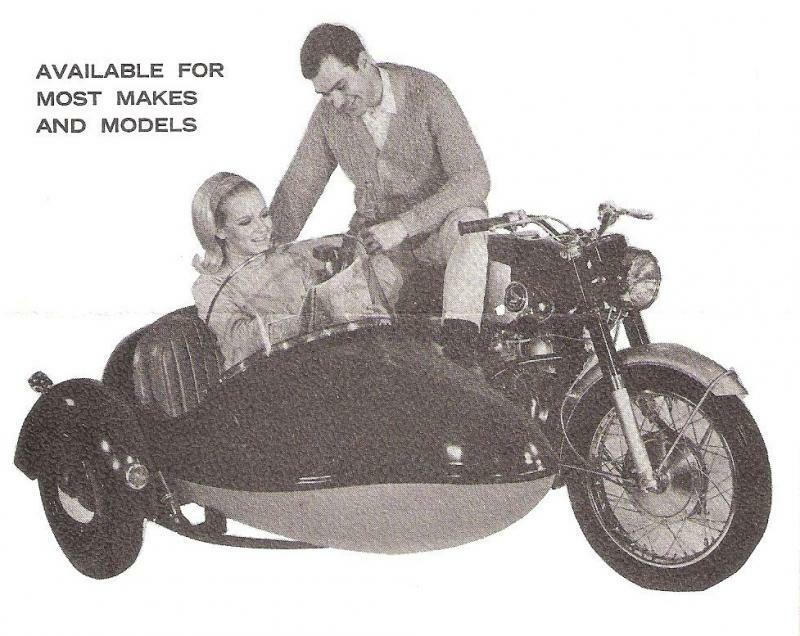 It could be ordered with rigid sidecar mounts or with Center-Flex leaning sidecar mounts. 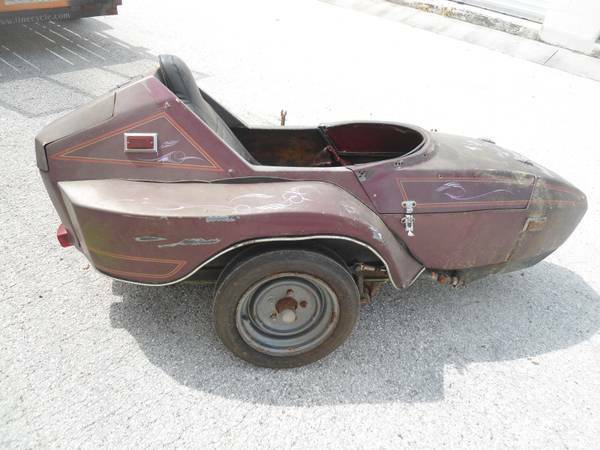 The body was based on The Spirit Of America, Eagle Sidecar body. 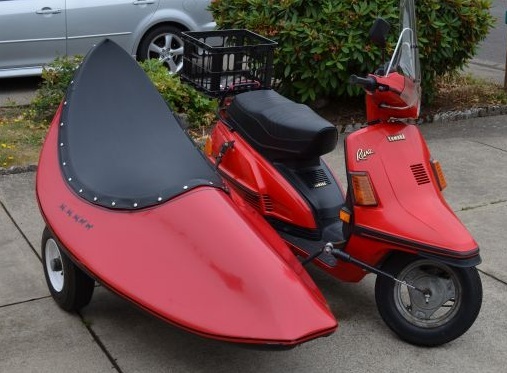 The Cyclemotive Sidecar was built for over 12 years and over 50 were made. 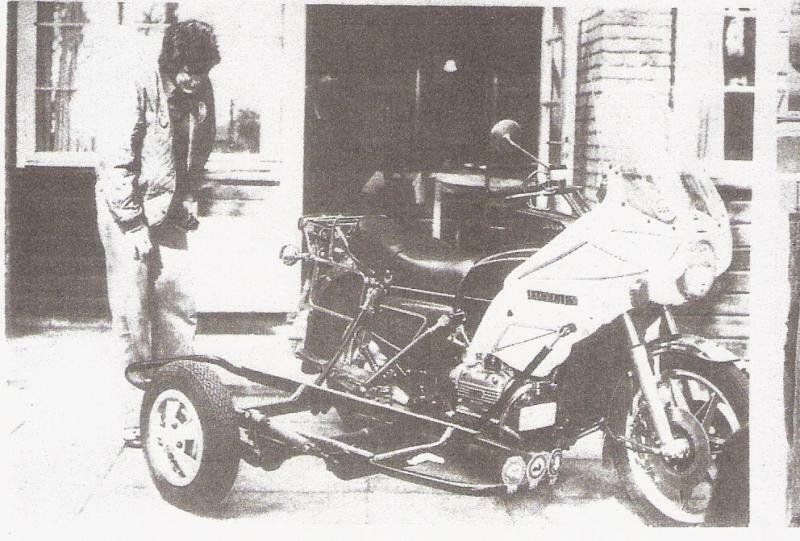 The company then went into converting rigid sidecar frames to Center-Flex (leaning) mounts with more than 100 frames converted. 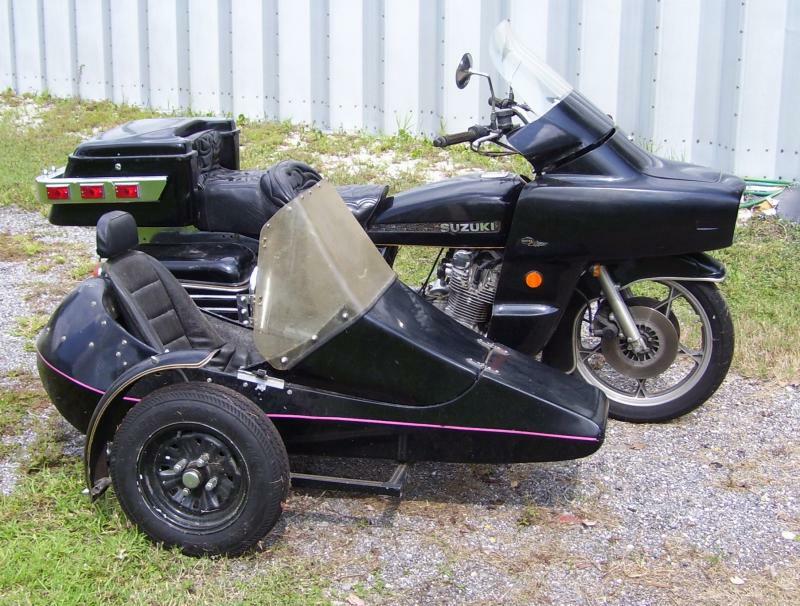 They also made a few of the Classic II sidecars and a double semi-adult tandem sidecar called The Raven in the late 1980's. 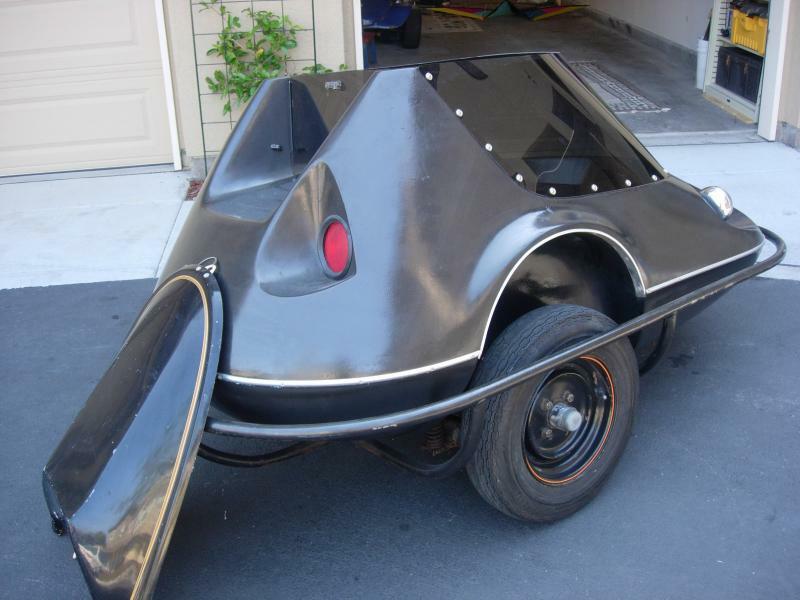 Thompson Cyclecar also made a Cricket Sidecar for BMX motocross bicycle racing. The information and pictures below are by Eric King. A big thank you to him! Hope you enjoy. Eric King, 2017. 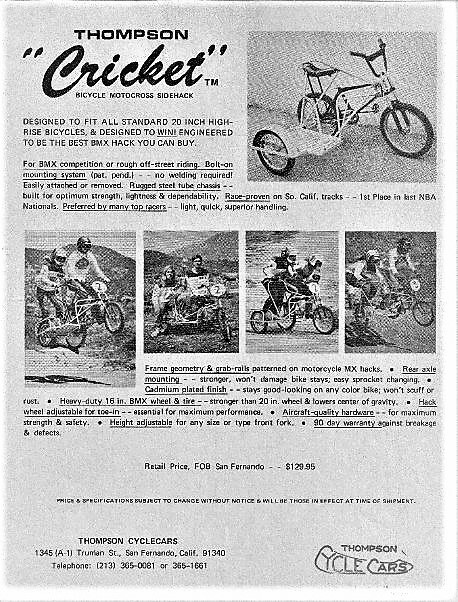 The Thompsom Cricket sidecar flying through the air at a BMX race in 1975 with Eric King and his monkey Howie Idelson. 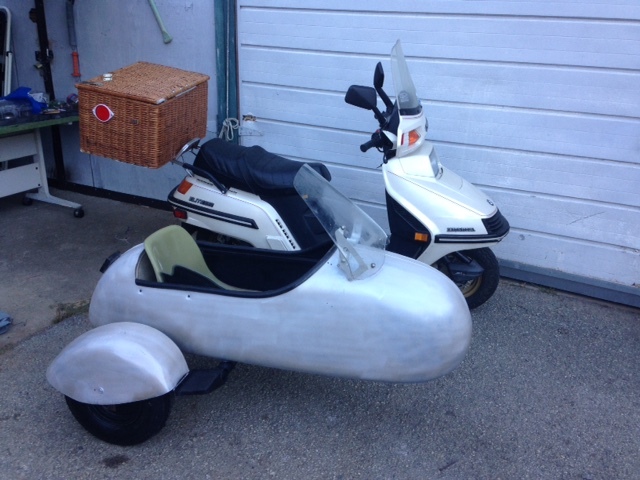 This is a 1957 Sears Scooter Sidecar made by an Aircraft Co. Thank you to Larry S. for the picture and information! 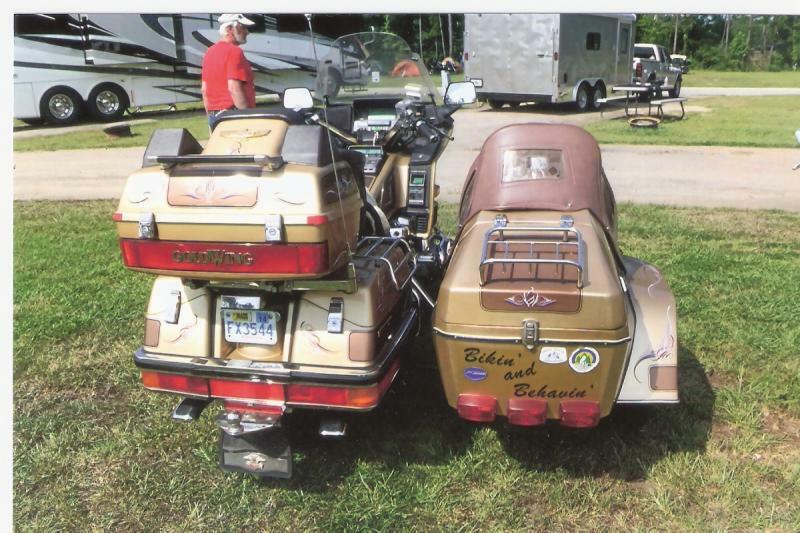 This is a GoldWing with Moline, Ultra Sidecar restored by Johnny P. in Houston Texas. 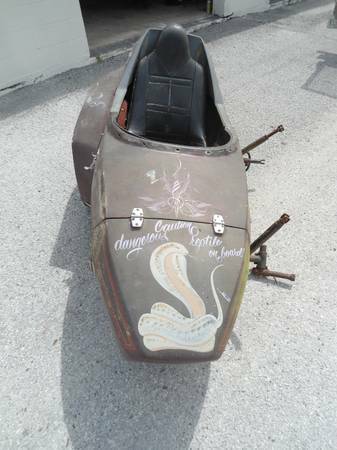 Moline Sidecars were built in the 1980's by Shirley Moline in La Luz New Mexico. It had a front hood that opened for easy entry, bucket seat with head rest, 7.8 CF trunk with exterior door, torsion bar suspension with gas shock, and convertible top. 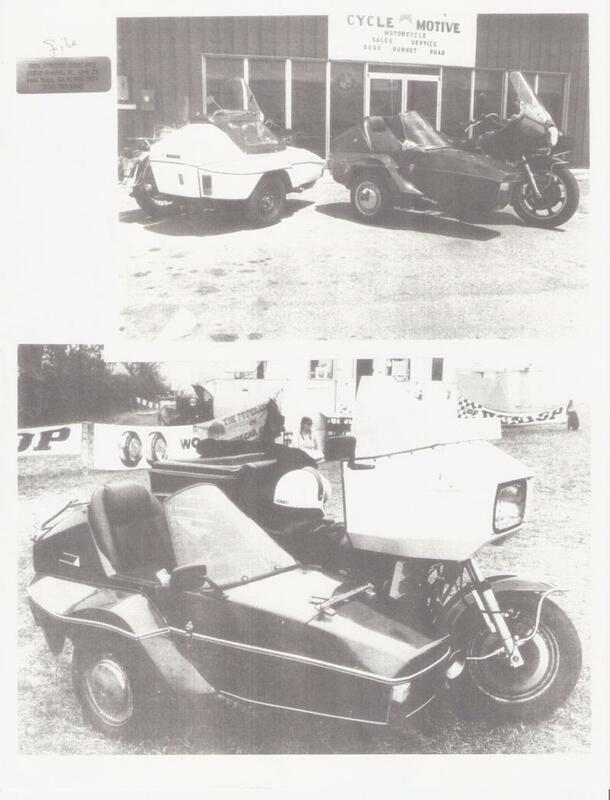 The Moline Ultra Sidecar specifications: came standard with black paint, two side marker lights and two to three taillights depending on model year. 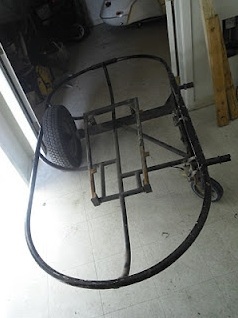 Frame was 1'' x 2'' steel tubing, fiberglass body 81'' long, tire 4.80 x 12. You could order options like chrome bumper, color matched paint & pin striping, carpet, head light, etc. Base price $3400, with options and color matched paint about $3800. They were still in business as late as 1989. A convertible top was a factory option. 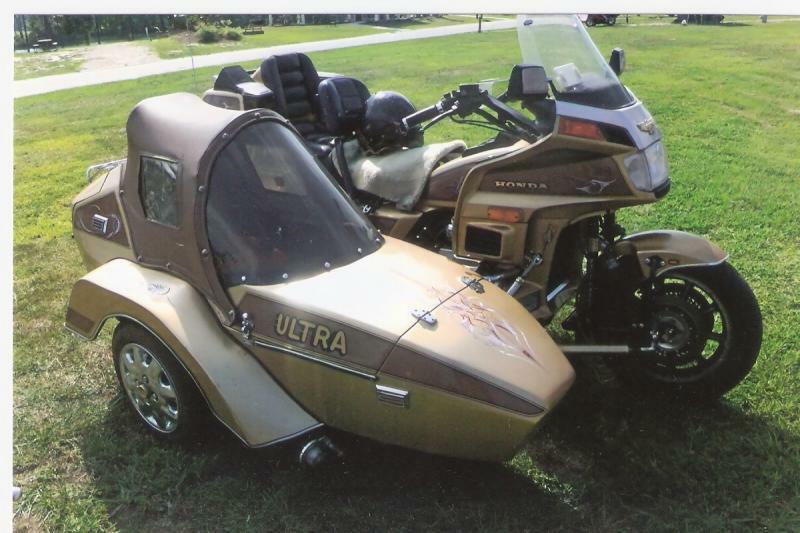 This Moline Ultra belongs to Keith W. who sent me many of these pictures and the Moline sales brochure which he got from Doug Bingham. Many thanks Keith. 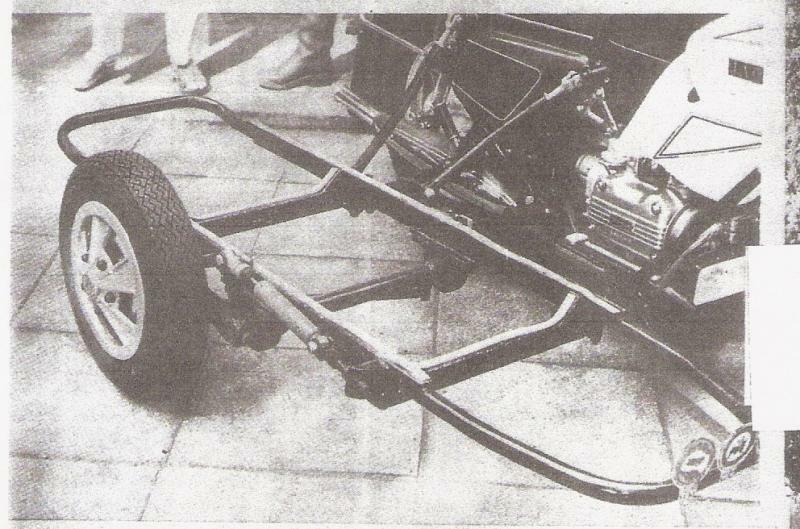 This shows a new Moline Ultra Sidecar frame and suspension with mounts. I believe this is Shirley Moline looking over one of her new Moline Sidecar frames at her factory in La Luz New Mexico in the late 1980's. 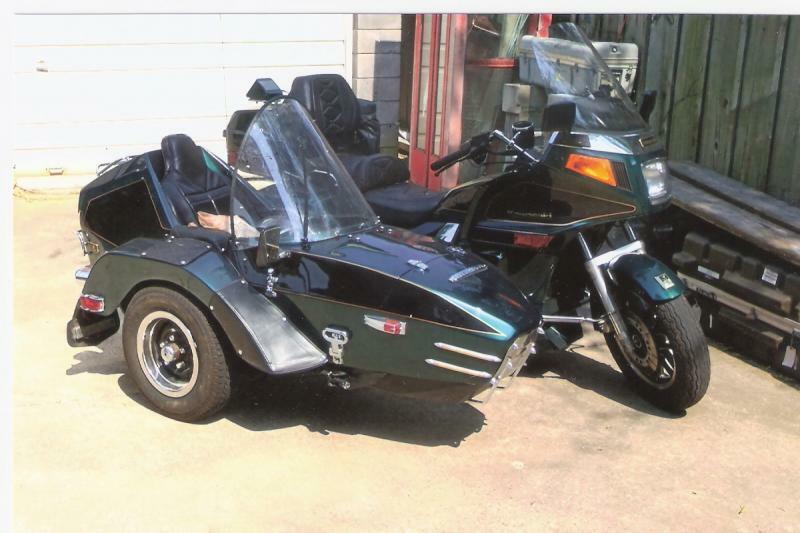 The Moline sidcar was a close copy of the Moturist Sidecar made in the Netherlands and imported in to the USA by Arlette Motorcycle Sales in Cedar Park Texas up to 1985. 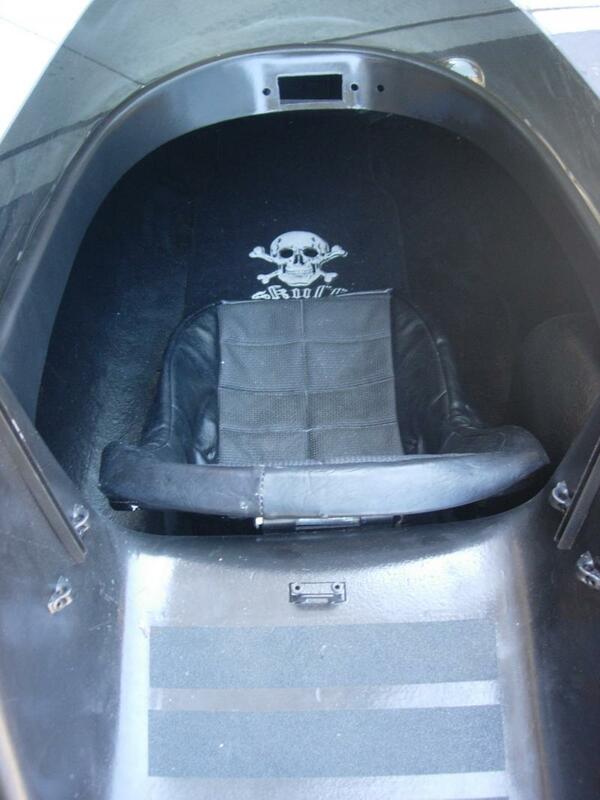 Zephyr Sidecar seat and dash board. 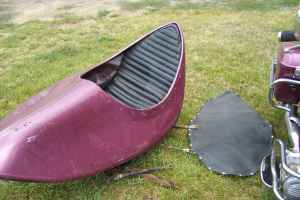 Zephyr Sidecars were manufactured by a boat company in Richmond California in the 1970’s. 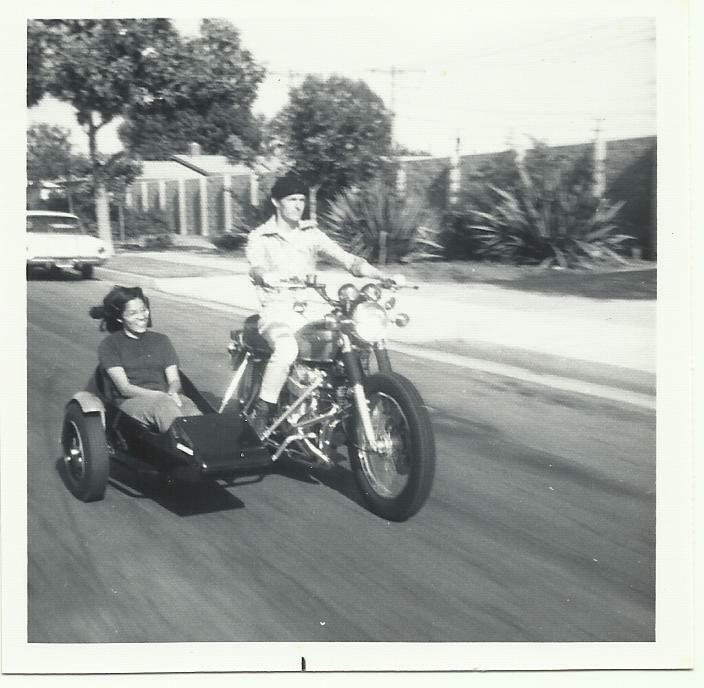 It was a large sidecar. Had a dash, one head light and tail light. The windshield was a piece of 1/8'' Plexiglas. 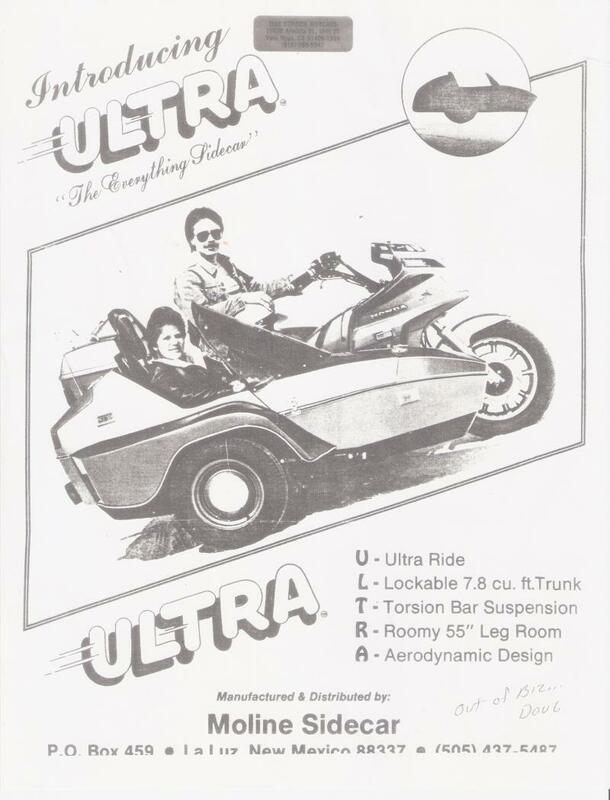 You had to get in the sidecar by climbing over the back of the sidecar but it was comfortable when you were seated. The hard part was climbing back out and down the rear. 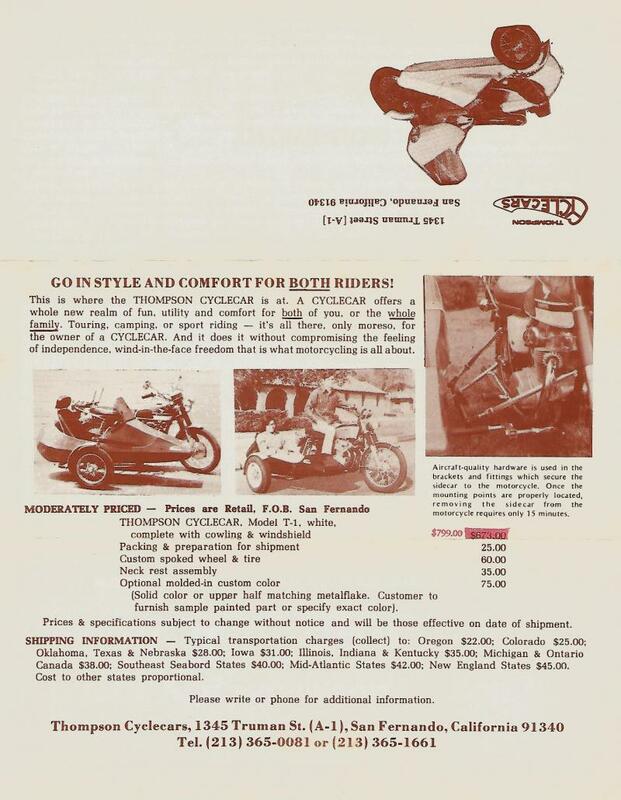 This sidecar was made by International Sidecar Corp in St. Paul, Minnesota in the late 1960's. 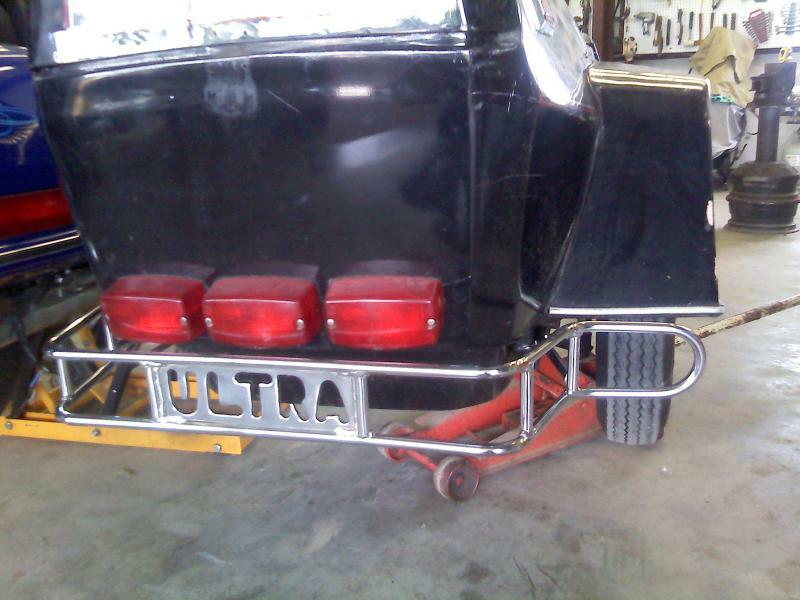 The fiberglass body came in two tones, red & black and black & white. Body width 24'', lenth 79'', weight 108 lbs. 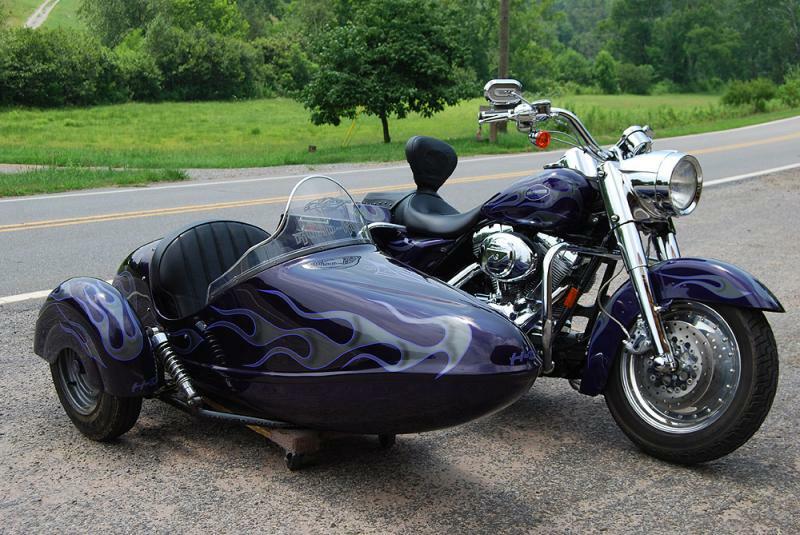 The below 3 pictures by Michel M. shows a great looking customized International Sidecar. International Sidecar owned by Tim. Thank you for the picture!